Locally owned Barkstown Road is your one stop source for all your pet needs. They specialize in quality food, toys and accessories – and of course, Rocko’s Rewards! Vines & Canines believes there to be only two necessities in life: a good dog, and a great bottle of wine. Stop in to shop or relax and enjoy a beverage indoors with your dog at your side. 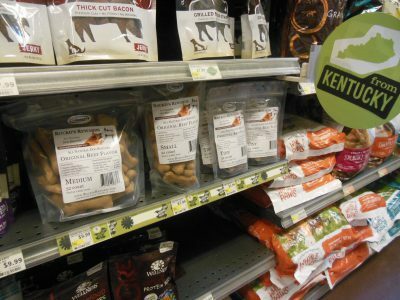 Vines & Canines carries small and tiny biscuits in Original Beef and Sweet Potato flavors, along with an assortment of Thorsted Gyncuits. Stop by Revelry to shop for works by local artists along with handmade jewelry, art, and home décor. While you’re there, pick up some Thorsted Gyncuits! Remember, you can always order on line and shipping is FREE ! ← Join us every Saturday 10 -2 at Douglass Loop Farmers Market, the Highlands’ only DOG FRIENDLY market!